Firstly, you may have noticed it has been quite a while since I've posted. I have a very simple explanation for this. Nothing worth noting has happened! I have been busy with school, to the point where my entire weekends are spent with Microsoft Word and a textbook in front of me. At least I should be graduated and have a "real job" by this time next year. Now for the real news. EARTH HOUR. Nearly every community in the world, at 8:30 pm this evening in their respective time zones, was tasked to turn their lights off and enjoy an hour in the dark to "vote Earth". I went above-and-beyond and actually flipped the power breaker off at my house. I went outside and checked out meter to verify -and indeed-, it was completely frozen still. And to think, I was actually expecting it to keep ticking! Who would've thought that the power companies were completely honest with their measurements? I guess the real test of that will be when the bill comes. 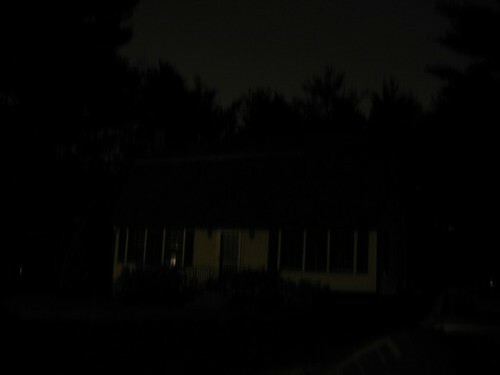 I took a picture of my house during this time of darkness. Besides the reflection of a nearby street light, it was completely dark. And completely eerie. Not too often is my house not lit up by the buzz of my computer fans and the hum of the refridgerator. Also, here's proof that I was using 0 kilowatt hours! In other news, Boston is again hosting International Pillow Fight Day! If you're from Boston, then check out the post on Banditos Misterious by clicking here. If you're not from Boston, then click here instead.